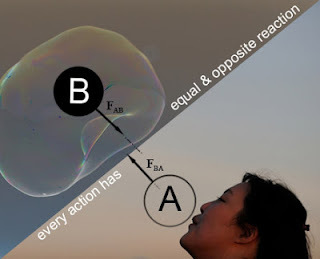 In the physical world Newton's Third Law describes the external reality configuration that every force / action has equal and opposite force / reaction. According to this law, every force ('action') on one object is accompanied by a 'reaction' on another, of equal magnitude but in opposite direction. While this is the law of the physical world, the metaphysical world also have equivalent laws through which they are created, sustained and operated. The gnostics (arefun) and the knowers of spiritual reality inform us through the unveiling from the Divine that every intention we make, every words we speak and every engagement we engage with, has not only effects in the external world of appearances but also have metaphysical impact as well which occurs in the reality of unseen. The inner world and the next world is influenced by our state, action and engagement. 'Every action here has equal and opposite metaphysical reaction, equalizing either here or in the hereafter' is the equivalent law for the unseen reality. The knowledge of ghayb or the unseen reality tells us that after death, human beings are questioned at the grave. There are three archetypal questions which one face, such as: Who is your Lord?, What is your Path? and Who is this Man? I wrote in a previous post titled "Three Archetypal Questions at the Grave" that our ability to answer these questions will depend on our state, on the haqiqa or the inner truth of our being while we were alive. These are the questions which can not be answered through memorization or merely through hear-say knowledge, but only if we know it through the entirety of our being, only if we lived that truth or had a life that witnessed the truth demanded to answer those questions. The third of these questions that is asked to every children of Adam is, "Who is this man?" while showing the Messenger of Humanity, Muhammad Mustafa, may Allah bless and send him peace and accept us among his community. Question is, how would we recognize him if we never recognized him metaphysically with our heart? Every Prophet, Messenger and Illuminated beings of humanity lived a life of both outward and inward poverty. There is hardly any exception. Name Moses, Jesus Christ or Muhammad, read their life and it will inform you that they all embraced their the utter needliness before God, they embraced spiritual poverty and their inwardness was also matched by their outward poverty. This is the truth. One of the major sign of love for these illuminated beings can be affirmed in a human being has love for the poor, if a human being care for the suffering of poor around him or her. That is why in Islamic Sacred Tradition the spiritual elders tell us that love for the poor is a testimony of one's love for Prophet Muhammad. In a tradition we read that a person came to Prophet Muhammad during his lifetime and informed him that he loves him. The Prophet warned him saying be prepared for poverty for those who love him will have visitation by poverty (inward, outward or both). The spiritual elders thus say that yes those who love the Messenger, for them turning away from the world will be easy and they would prefer poverty over the affluence of this passing world of maya, characterized by constant entropy, loss. Now going back to the archetypal question of the grave, if one who did not follow the Messenger, did not understand him or his way of being, didn't love what he loved, didn't embody compassion like he did (no matter how small it is in our case as compared to the immensity of his being) and also didn't love and preferred poverty and the poor as the Master did, there is very little possibility that his or her soul will recognize the Messenger when his face is presented for recognition. It is very possible that he would appear as just another poor person in old patched clothes, hundreds of which their familiar eyes passed but never cared to lean with their heart with compassion. If all our life we lived engrossed in the glitters of this passing world, if all our life we never thought twice about other's suffering - then this itself is a testimony of our unenlightened state of heart. Prophet Muhammad had his genuine followers mostly from the poorest section of the society and who himself was most at ease with them, just was the earlier Messenger in the chain of succession, Jesus Christ, son of Mary, who often sat and dined with the marginal and poor of his time. If our own being has no inclination like how their hearts had genuine compassion and attachment for the poor and marginal, then it is very possible that metaphysically speaking we will also not recognize them, but will mistake them in our confusion just as any other poor people even if we pass by them (as did those who met yet rejected him during his lifetime and saw nothing but a poor person in them, a man who mingles with people having less abundance). Their disdain was so much that they mocked Jesus even during his intense agony, they drove Muhammad out of his town and rejected him and his poor and marginalized early followers. In an universal sense we all are poor, we all are in need of God's grace. Only when we loose our good health, only when we fall in old age and lesser in economic affluence then we realize what blessing it is to have sound health, how much we take for granted all the blessings, both seen and unseen that we enjoy, what it means to live having nothing to eat or no one else to care. Thus loving the poor is by extension, loving 'thy neighbor', loving the poor is loving Christ and loving Muhammad and his family and his companions and friends, loving the poor means loving all of humanity for we all are poor before God in constant need of His Grace and Loving Attention just as an infant is in need of her mother. The ascension to love of the Prophets, of the Messengers can be achieved if we cultivate love for the poor, for their sacred hearts also loved the poor, embodied spiritual poverty and sacrificed for poor. Like a reflected reality, just as the testimony of love for the Messenger is friendship with poverty (outward and inward), similarly friendship, compassion and concern for the poor also facilitates love for the Messenger to be born in the heart. 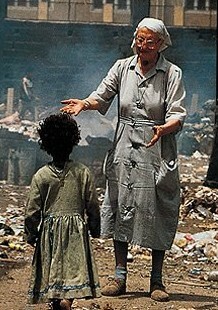 Love for the poor is a testimony of our faith evolving to a higher stage and our heart growing with illumination. Follow the True Man, Adore the Perfect Man (in every human). To follow the True Human Being, to Adore the Perfected Human Being - one must have a heart which can recognize such a Human Being and once one recognize such one, one's spiritual progress is dependent upon the heart's capacity to Love that single Human Being with all it's heart, all it's mind and all it's soul. The renunciation of the passing world and loving those who have renounced this world will lead to the love of the spiritual kings and princes who are the masters of renunciation. He who has recognized the King and befriend the King in His Kingdom of Splendor, what is there for them in this lower world which is but a carcass? May Allah grant us the station to recognize our Master as he deserves to be recognized in this very life, may Allah increase our love and compassion for those who have less than us. Ameen. What is the relation between Love for the Poor and Love for the illuminated beings, the Messengers of God? How Poverty and Love for Prophet Muhammad is related?